Aleksandar Vučić’s Wikipedia profile has been sanitized by a lobbying company. The Serbian government lied when it denied being the client of London-based lobbying firm Bell Pottinger. In 2014, the Government of Serbia and PM Vučić’s Serbian Progressive Party were both clients of Bell Pottinger at the very same time. 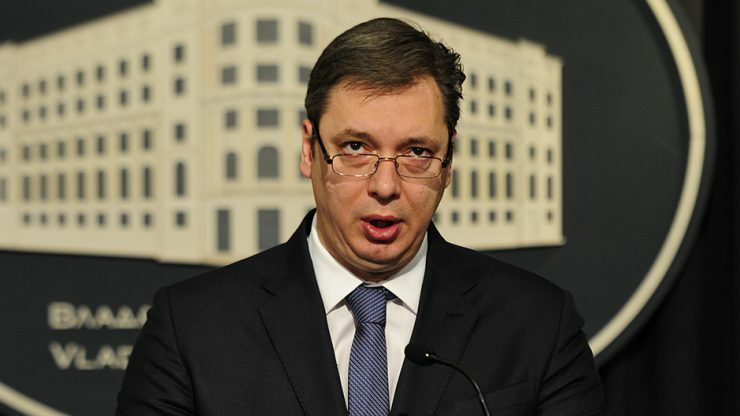 If you check Aleksandar Vučić’s Wikipedia profile, you will see that he had “a 71 per cent personal approval rating in a March 2013 opinion poll”, “has been central to negotiations on Serbia’s bid for EU accession” and “urged Kosovo Serbs to ‘leave the past and think about the future‘”. You should know, though, that these edits were made by a lobbying company hired by the Serbian Government to whitewash Vučić and his Cabinet. London-based Bell Pottinger is one of the largest multinational PR firms. It is also a secretive company. Bell Pottinger staff member disclosed his affiliation and the client’s identity because the lobbying firm was investigated by Wikipedia at that time. Conflict of interest editing, including paid editing, is strongly discouraged on Wikipedia. Known to sanitize its clients’ Wikipedia entries, inflating achievements while removing negative information, Bell Pottinger had come under investigation after a series of scandals involving false or fraudulent Wikipedia edits. In September 2014, when Serbian opposition and media accused the Government of having a secret contract with Bell Pottinger, both Vučić’s Cabinet and his party vehemently denied. Serbian Progressive Party (SNS) described the statements as “full of heinous lies and accusations”. The Government of Serbia denied having “any contract with the agency Bell Pottinger” and paying any money to the PR firm “for lobbying and building the image of the officials of the current Government”. There has been an effort to cover up as much information as possible about the contract between the Serbian Government and Bell Pottinger. Prime Minister Vučić has put pressure on independent media. Bell Pottinger’s entry in the EU’s Transparency Register (a voluntary lobbyist register) has been erased. But despite Vučić and his lobbyists’ efforts, OSI has documentary evidence proving that the current Prime Minister of Serbia used public funds to finance his 2014 campaign. 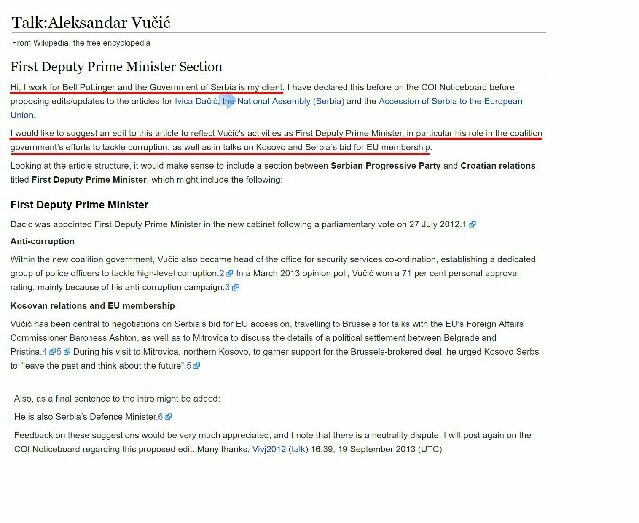 Bell Pottinger gave the positive spin to Vučić’s Wikipedia entry in September 2013, couple of months before president Nikolić call for early election. Couple of months later, the Government of Serbia and PM Vučić’s Serbian Progressive Party were both clients of the lobbying company. OSI can now reveal that in 2014, Bell Pottinger provided services for Vučić’s Government and SNS at the very same time. Bell Pottinger is a member of the Association of Professional Political Consultants (APPC), the self-regulatory body of UK public affair practitioners. APPC publishes a register offering information about which clients are represented by the Association’s members. According to the APPC Register, in 2014, Bell Pottinger was lobbying for the Prime Minister of Serbia, Aleksandar Vučić, while at the same time was lobbying for the president of the Serbian Progressive Party, Aleksandar Vučić. Incompetent and corrupt leaders hire lobbyists to whitewash their regimes. Aleksandar Vučić has a lot to hide. That is why the Government of Serbia, one of the poorest, most undemocratic and most corrupt countries in Europe, is a major client of lobbying firms.